In 1960, President Eisenhower was focused on Laos, a tiny Southeast Asian nation few Americans had ever heard of. Washington feared the country would fall to communism, triggering a domino effect in the rest of Southeast Asia. So in January 1961, Eisenhower approved the CIA's Operation Momentum, a plan to create a proxy army of ethnic Hmong to fight communist forces in Laos. While remaining largely hidden from the American public and most of Congress, Momentum became the largest CIA paramilitary operation in the history of the United States. The brutal war, which continued under Presidents Kennedy and Nixon, lasted nearly two decades, killed one-tenth of Laos's total population, left thousands of unexploded bombs in the ground, and changed the nature of the CIA forever. 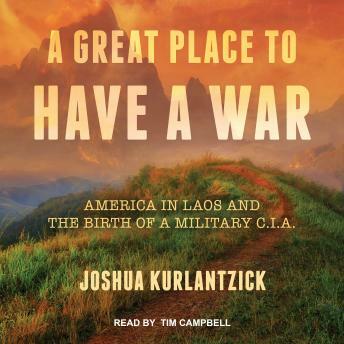 Joshua Kurlantzick gives us the definitive account of the Laos war and its central characters, including the four key people who led the operation-the CIA operative who came up with the idea, the Hmong general who led the proxy army in the field, the paramilitary specialist who trained the Hmong, and the State Department careerist who took control over the war as it grew.